I am a Christian writer. I write Devotionals and I write Christian fictional stories of Jesus Christ. My books can be found on www.lulu.com/gpiper. I am writing you to thank you for the journey we have shared together for so many years, we have walked a path together that has had many twists and turns. When I sat down many years ago to begin this journey I never dreamed that my life would be touched as much as it has been, never dreamed that Glory Seeds would become what it is. Your presence in my life has brought great joy to me as I have journeyed my path through many challenges, it has been through your presence and prayer that I have overcome those obstacles and have been victorious. It is with both joy and sorrow that I am coming to you today, our journey has come to and end and now we must part. We have come to the point in our journey that brings us to a fork in the path. While I may not be with you physically, I will always be with you. In the sweet and sacred place that is within each and every one of us will still be together. When we started this journey together it was my dream that we could deepen our walk with God together, that could learn from each other. Today my challenge to you is that you not let the work end here, this family we have built together is just the beginning of a work that is greater than you or I. Pick up the torch and continue the race, we are a blessed people and need to be a blessing to others. We are blessed to be a blessing, it is our calling to go forth and fulfill that calling. My mission for you is to go forth and bless! The time has come for us to part ways, however, this is not goodbye! I leave you with these parting words by M Dixson, As I travel down the paths of life, I long for the journey’s end for my destination is with m savior resting in the arms of my best friend. So well said and done. Gracias. I wanted to make sure this got out to Gary’s readers. It saddens me to think we have lost a friend and such a supportive person, but he is where his true home is and I have to think that is where his heart truly belongs along side God. There is no way to say he is in a better place that will comfort those that lost him without sounding cliché and hearts will be broken over this loss. Gary was there to take over things for me when I was no longer able to keep up with NSMinistries.com and will be missed by the readers there as well. Please pray for his family and friends for the comfort they will need. Once upon a time a man was hitchhiking on a dusty road headed toward a big city and on his back he carried all his worldly possessions. As he walked he was suddenly passed by a man in a pickup truck, after he passed the hitchhiker he looked into his mirror in time to see the man fall to the ground because of his heavy load. The truck driver stopped backed up got out of his truck helped the man to he feet and said, “Sit on the back of my truck and I’ll give you a ride into town.” The hitchhiker smiled and sat down facing the backwards. Several minutes later, the driver looked in the mirror and saw the man leaning over as if he were going to fall out. The hitchhiker still had his heavy backpack on. The driver stopped the truck walked to the back and suggested to the man it would be better if he would take off the pack and lay it in the back of the truck. 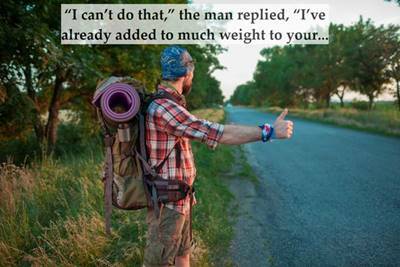 If you’ve asked Jesus to forgive you of your sins or lighten your burden then don’t be like the hitchhiker and continue to let them burden you. If he had not wanted to take them from you, he would have stayed in heaven. Got Burdens? Give them to Jesus He knows what to do with them! Jesus… Don’t face the future without Him! The problem with nothing new under the sun is today is a new day. There has never been a April 25, 2018 and there will never be another either. “This is the day the LORD has made…” While it is true today holds some old “stuff” it is also a treasure hold of new experiences, new adventures, new “stuff.” Today is the first day of the rest of your life. Will today be the day when your prayers are answered? Will today be the day you find yourself finding a new career? Will today be the day you find yourself facing a storm thrust on you? Will today be the day when the LORD takes you home? Today is a day of endless possibilities as we look to God for the life coming forth out of the unknown. Do you remember the song “One day at a time sweet Jesus that’s all I am asking from you.”? Better advice has never been given especially in a world that is racing faster than a New York minute! One of the beauties of a garden is time seems to slow down allowing us to slow ourselves down and “smell the roses” taking time to be with God, to be still, to listen, to experience the endless possibilities He as prepared for us. I come to the Glory Seed Garden alone, while the dew is still on the ground, and the voice I hear falling on my ear is the Word of God talking to me. God is not only the Author of new days, He is also the Author of new “stuff” live in today yet do not anticipate what has not happened yet, God is also the God of Surprises! Gardens have a special place in the bible. Life as we know it began in a garden, the Garden of Eden. 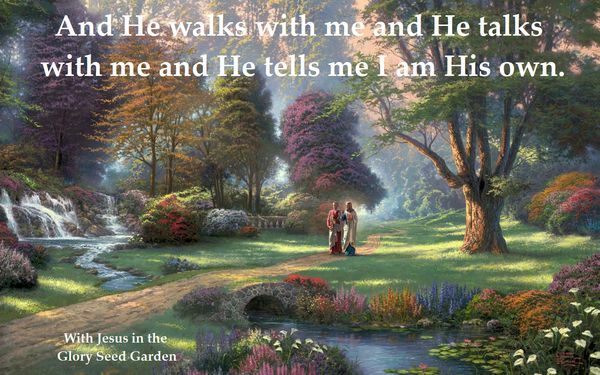 And it was in the Garden of Gethsemane Jesus opened the road that leads to eternal life for us. 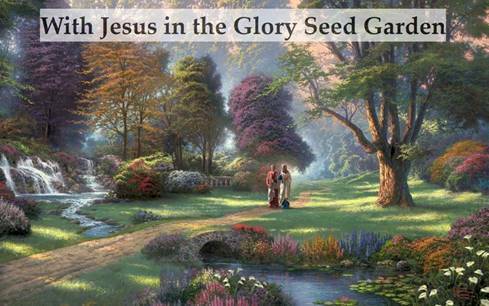 Come to the Glory Seed Garden, come alone or bring a friend. Breathe the Garden’s Fresh Air, experience the touch of the Master’s Hand. Feel the Holy Spirit gently plant Glory Seeds in the Soil of your heart. Experience the soft golden glow of Heaven’s Light. Enjoy the gentle songs of Peace sang by the Angel Chorus. Feel the exhilaration as the seed dies giving way to Life . And savor the flavor of God’s Sweet Salvation! God gives the seed, we plant the seed in the Glory Seed Garden (you, the reader), Jesus gives the seed life, and the Holy Spirt makes it grow.